From the very beginning of the book I was blown away with the wonderful writing and the exciting stories you had to tell. I loved learning about my ancestors and how your family resembles them in different ways. I loved to imagine you as a little girl. It was a delight to read the wonderful stories. Thank you. * Wonderfully clear-headed memoir, written with humor, sensitivity, and a clear eye, telling a well-known story about people forced to leave everything behind, lucky to escape with their lives, and strong enough to rebuild. It speaks of the strength of family ties in good and bad times, and it is most of all a fantastic read. * Sublime! This is one of the most beautiful stories I have read. It deserves a place among the great nostalgic tales of lost worlds: Proust's "Remembrance of Things Past", "The Cherry Orchard", etc. Melancholy, sensitive, it evokes a way of life that was, and is no more. The descriptions are elegant, and filtered through the innocent eyes of a young girl: the love of those who populated her world, the beauty of the surroundings and rituals, and finally...the loss of it all. Read it slowly, lovingly: this is a story to be savored. * The poetry of the words pulled me in, and I was soon immersed in this journey to worlds now lost to us. Truly beautiful. * An intimate look into a time and place and life of an unusual Jewish family in Egypt. Fascinating, lovely and poetic. * This is a superb book. Mrs. Naggar is a gifted writer. Her expressive use of words is true art and literature. I love it so much I sent this to a friend. I just had to share. This book represents the quality that makes reading a joy. * I so enjoyed reading the journey of Ms Naggar's life. It is a wonderfully written book that I would so love to see as a film or PBS series. I could taste the food. I could feel the joy. I could feel the tension. Marvelous, absolutely marvelous book. I am so grateful to Ms Naggar for sharing her story. It is not only entertaining, it is educational and indeed a reminder of miserable times we should never forget that further strengthen us in ways we do not realize. I highly recommend this lovely book. * I found the book extremely well written. the choice of words exactely as it should be to make you fully understand the feelings , the situations,the loss of a wonderful life,the loss of people the author loved the description of places, countries , even the sight and the smells, and obviously, the whole atmosphere. The author has the fantastic capacity, with her words, to transport you, in the situation. * At 3AM I finished the last page of SIPPING FROM THE NILE. This book was perhaps the most beautifully written family memoir (not soapy or melodramatic) I've ever read. Ms. Naggar's memories of her family (past and present) were so vivid that I felt that I was a family friend privileged to visit. The history of Jewish Egypt was riveting. I read this book on my Kindle and it was the first time I ever highlighted passages of a book I've read. I highly recommend this book to anyone who is part of a family (aren't we all?). * Superbly written. One of the best books I have ever read. Visualization superb. Can't recommend sipping from the nile highly enough. * An engaging and informative book, Jean Naggar's Sipping from the Nile offers the pleasures both of a historical novel and of a mémoire. It presents her life as she remembers it, dense with extraordinarily vivid details of architecture, cuisine, clothes, furnishings, rich interiors redolent with her own childhood memories. But it is also a detailed portrayal of a tempestuous period in the history of the Middle East in general and Egypt in particular. Her personal story covers approximately two decades, the 40s and 50s, with the opening of the Suez Canal in 1956 a landmark and a caesura. But by introducing parents, aunts and uncles, grand parents and great grand parents she traces the family's presence in Cairo back to 1750 and their earlier history back to the 15th century when Spain expelled its Jews in 1492. She has created her own remembrance of things past including the tastes and smells of spices in traditional dishes. The reader can touch and taste and smell what is evoked in these pages and share the author's vivid sense of loss. Read and savor and enjoy! * I highly recommend :Sipping from the Nile".It is a book I could not put down.Beautifully written,it reflects the life of a young Jewish girl brought up in Egypt.The traditions and atmosphere of that time are carefully and accurately described and it is the most incisive picture of Egypt since the Laurence Durrell books. * I felt as though I had stepped foot in Egypt and walked the very path and life Naggar had. Her words are beautifully crafted and I enjoyed this beautiful memoir of her childhood and life in one of the world's most gorgeous and historic lands. * While the story is remarkable, the quality of Ms. Naggar's telling of the story uniquely sets this book apart and above She described special foods in such detail I could almost taste them. Scenes, fabrics, colors, smells, temperatures... they are all wonderfully and creatively described for the reader's enjoyment and understanding. This is not one woman's story but rather the stories of many people within and surrounding her life and ancestors. Do not miss this great read! I'm sharing my copy with a "bookish" friend tonight! * Absolutely riveting! It is a wonderful glimpse into what Egypt was like, and also an excellent view of how things changed, and the hardships people faced that most people probably aren't aware of. If you have visited Egypt, it will be a trip down memory lane in many respects, but also so eye-opening to learn what it was like living there. Things we as tourists didn't see necessarily. If you have an interest in history, this is a must read! I highly recommend it, and will be hoping to find more works by Jean Naggar! * This book is so much more than a personal memoir; it shows history and humanity through the eyes of a curious little girl. This wonderfully written tale is enthralling from beginning to end. 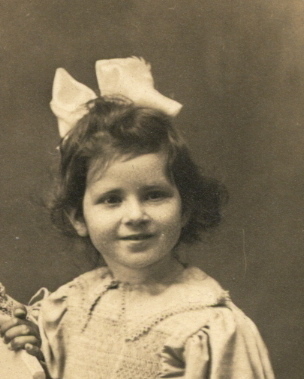 fascinating account of a family’s life, history, and eventual exile. Click on the link above and read the review, and please take a moment to visit this month's blog post. Click on this link for MARCH blog post. Scroll on down. ...this is one of my favorite genre of books and this one is extremely well done. The writing is excellent...Although memoirs can be dry, this one is not. It is interesting, informative and touching. Ms. Naggar has included so much heart without becoming syrupy, so much history without becoming pedantic and so much of herself without showing conceit. Wonderful! "This book is extremely well written, poignant, historical, and filled with people from her aristocratic Cairo family who come across as real and fascinating as characters you'd meet in the best fiction..."
Viviane Kirsch awards Sipping from the Nile five stars. in her October 2013 review : "Once you start reading it, you will not be able to put that book down!" She also writes "A very well written account about the golden life of an Egyptian Jewish family before their forced exodus in 1957 due to political reasons ... The narrative, full of emotion and rich in descriptions, is accompanied by authentic photographs." "I so enjoyed reading the journey of Ms Naggar's life. It is a wonderfully written book that I would so love to see as a film or PBS series. I could taste the food. I could feel the joy. I could feel the tension. Marvelous, absolutely marvelous book. I am so grateful to Ms Naggar for sharing her story... I highly recommend this lovely book"
"One life in Cairo exposes the meaning of today's Arab revolution. Jean Naggar's Sipping from the Nile: My Exodus from Egypt achieves the goal of memoir--to illuminate the full context of life by examining one life within that context. The writing is transparent, evocative, and muscular while the events brought to life are consequential for us all. Read this book if you want to understand our world! Naggar's intense focus on the individual life explains what is at stake in the revolution now taking place in the Arab world. "My favorite way to learn history is through the eyes and lives of those generous enough to share their stories. Jean Naggar’s memoir — subtitled “My Exodus from Egypt” — is the best kind of memoir.... each story comes to life in a tapestry of privilege and responsibility. The pages fly by and the reader is able to get a rich sense of Egypt’s history through the fascinating lives of her family. I am so grateful that Naggar shared her story. I had the privilege of visiting Egypt years ago and now feel much closer to this country after experiencing Naggar’s story. I RECOMMEND IT!" READ THE GUEST BLOGS on the My Works page. Check out my Blog Please take a moment to add to the Comments! Please communicate with me through my Contact page before you leave the site. I would so much appreciate hearing from you. I always respond! Jean Naggar was born Jean Mosseri in Alexandria, Egypt on December 5th, 1937. She grew up in Cairo and attended the Gezira Preparatory School and the English School in Heliopolis before going to boarding school at Roedean School, Brighton, England. She and her family left Egypt in 1957 following the international Suez crisis. She attended Westfield College at London University and was awarded a BA Hons. degree from London University in 1960. In 1962 she married Serge Naggar and moved to New York City where she has lived ever since. She lives in Manhattan with her husband, Serge, and is the mother of three and grandmother of seven. Her son, Alan Naggar, lived in California. He was an actor, director and theatrical producer. Her son, David Naggar, works at Amazon.com in charge of self-publishing and Kindle content worldwide. He moved to Amazon and Seattle after 16 years in various executive positions at Random House, followed by a year as President of iAmplify, an internet start-up focused on digital content and distribution. Her daughter, Jennifer Naggar Weltz, partner in the literary agency Jean founded in 1978, the Jean V. Naggar Literary Agency Inc.(JVNLA), is now President of JVNLA (see link on right). She runs the business, while also operating as agent of her own list and rights director for the agency. I hope to include some links that will give a larger portrait of ancestors and the way the lives of this significant community of Sephardic Jews were tightly interwoven with the Egyptian socioeconomic landscape from 1800 on. Great-grandmother Elena's ancestors. Click on the link! Disturbing information about events taking place in Alexandria, Egypt. Read the blog by Lyn Julius and join the international outcry. The last Jews in Egypt are under siege today. The situation of the dispossessed Jews of Egypt needs everyone's help. A last bastion has fallen. Lyn Julius writes: The Jewish community in Alexandria no longer runs its own affairs, a Jewish visitor discovered on a visit to Egypt in March. I remember walking carefully holding a white wax taper taller than I, into the vastness of this beautiful sanctuary ahead of a bride following her small attendants in clouds of white tulle. We advanced amid gasps of admiration from the packed guests. The flame on the taper trembled in my hands and drops of wax slid down, as the synagogue organizer hovered over us, anxious that the flaming tapers should not slip from small hands and cause a fire. I am not sure whose wedding it was, but I think it was one of the daughters of my father's Uncle Maurice Mosseri. The portrait seems to be of Yacoub Cattaoui Bey (see link above), a bow to the temple's illustrious past? 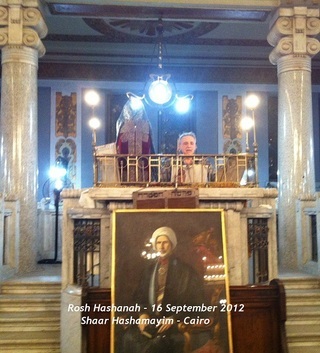 It seems from this recent link that services took place in the Cairo synagogue, complete with minyan and rabbi. The series of photos included in the link is comprehensive and lovely, and seems to indicate a fairly numerous community with some younger participants, possibly supportive visitors from other countries. I was amused and interested to observe that the vast space of my childhood memory seems not vast at all.